The Whispering Wall is a famous and and unique attraction, located just out of Williamstown in the Barossa Valley. The Barossa Reservoir is a magical place because of the curious acoustic effect that the curved dam wall creates. It is said that even whispers made by someone standing on one end of the dam can be heard clearly from all the way on the other side. 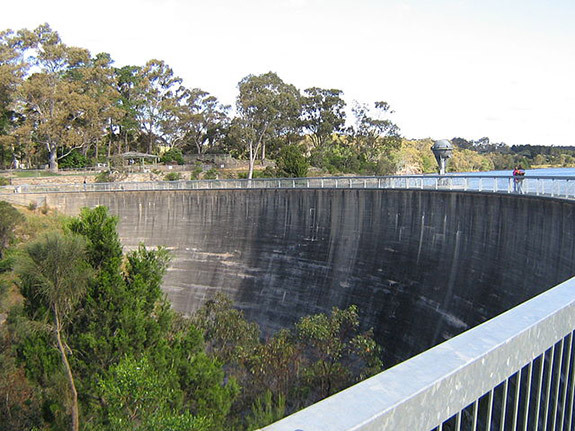 A feat of engineering – The Barossa reservoir Whispering Wall was built between 1900 and 1903, originally planned as a backup water supply for the growing population of Gawler. Nine Stories high, the concave wall was once the highest dam wall in Australia. It’s incredible – the wall really does whisper. Hearing children and adults alike have amazed conversations from side to side is a little bit special. This is due to the Parabola Effect, the wall, being a perfect circle causes the sound to bounce in a series of straight jumps along to the other end. Approximately an hour north of Adelaide – this is a great destination for a morning adventure launching from the city, before stopping off at Williamstown for a bite to eat.